Nearly two months after the cross-country Eighth Grand National Indigenous March won a law prohibiting any highway project through the Isiboro Securé National Park and Indigenous Territory (TIPNIS), construction of the project has finally been suspended, but not stopped. The Brazilian contractor OAS has laid off 80 of its 800 workers, and pulled back its work camps, machinery, and work teams from areas of active construction, reports today’s Los Tiempos (Cochabamba). The layoffs were reported earlier in the Brazilian newspaper Valor (secondary coverage from the Erbol community radio network). Update: OAS now reports that it is laying off 411 additional workers, leaving just 300 on staff “for continuity” of its operations. The worker’s union reports even larger layoffs: 350 on December 14 and another 350 on December 15. (source: “Despido masivo en OAS; la ABC no halla motivos,” Los Tiempos, 15 December). Evo Morales criticized the move and the company. Further Update (January 7): The Brazilian ambassador to Brazil, Marcel Biato confirms a “slowdown” in work, but attributes it to the rainy season, rather than any monetary dispute. The ambassador mediated in the Decemeber impasse between OAS and the Bolivian government, and claims to have resolved it. [Opinión puts it this way: Biato, que había interpuesto sus buenos oficios para superar el impasse, dijo que aquello ya no es tal. ] Biato states that he expects the Bolivian government to renegotiate Segment II, but reiterates there is “no hurry” to do so. The immediate cause of the paralysis in new work is a dispute between OAS and the Bolivian government over financing. While most of the funds (US$322 million) for the project are being provided by the Brazilian state development bank BNDES, the Bolivian government share had been set at US$190 million. However, the Bolivian government is now offering just US$143 million, although the reasons for this are unclear. Workers on the project have offered the Bolivian government a 48-hour deadline to resolve the issue or face mobilizations. A map from the Bolivian Highway Administration illustrating the road project from Villa Tunari to San Ignacio de Moxos. The boundaries of TIPNIS appear in yellow. Segment I ends at Insinuta, while Segment III begins at Montegrande. The Bolivian Highway Administration (ABC) claims to be working within the mandate of Law 180 protecting TIPNIS, but has doesn’t seem to have worked out that the current route of Segments I and III essentially require a cross-TIPNIS connection. ABC official, however, have deferred the issue to Cochabamba Governor Edmundo Novillo (of the ruling MAS party) and the highway booster committee. Meanwhile, the Beni Inter-Institutional Committee and the Cochabamba Association of Emeritus Engineers have worked out alternate routes. 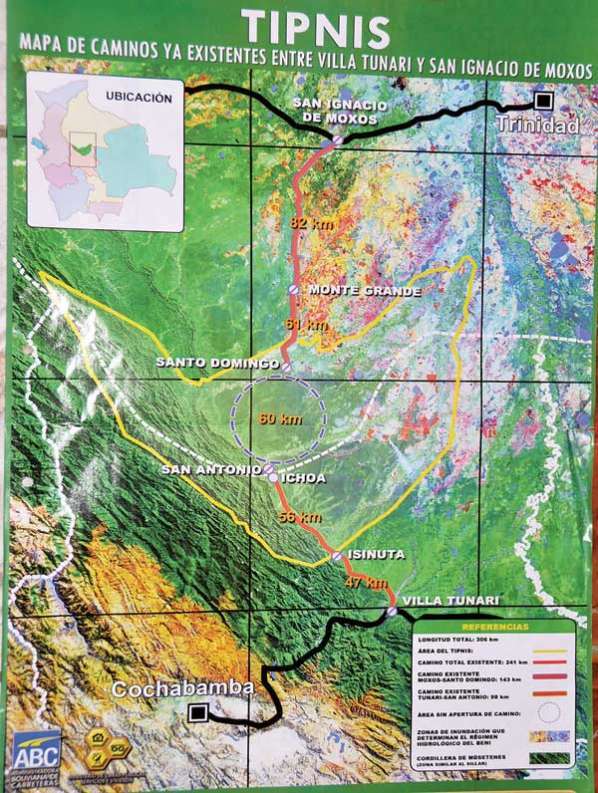 The Cochabamban engineers proposed 270- to 300-km routes east of the park or a 749-km route northwest of Cochabamba to Trinidad in Beni. They estimate a cost savings over the current project, but realizing that cost savings requires stopping construction. The Beni group came up with an additional route passing immediately west of TIPNIS. Despite the existence of alternatives, the debate over the future of the highway continues to be a political one. The national government, the MAS party in Cochabamba, and a quasi-independent organization of indigenous in the colonized zone of TIPNIS called Conisur continue to be the heart of the pro-road effort. President Evo Morales and Vice President Álvaro García Linera continue to vocally advocate for construction on the original route. The Bolivian government is pursuing parallel, but opposed tracks on the issue: authorizing regulations protecting the park on one hand and organizing a civil society campaign to overturn these decisions. Some members of the Villa Tunari–San Ignacio de Mojos Highway Booster Committee, however, have expressed flexibility on the route. And several prominent Bolivian grassroots forces have distanced themselves from the campaign for the road, notably the national colonizer federation (the Union Federation of Intercultural Communities of Bolivia) and peasant union founder Genaro Flores. This week, the Pact of Unity split deepened into two separate meetings on Bolivia’s future agenda. The 1st Plurinational Forum to Deepen the Change met at Cochabamba’s Casa Campestre while CIDOB and CONAMAQ organized their own summit in Santa Cruz. Despite the best efforts of the road-through-TIPNIS campaigners, it seems that the issue will be left for regional Sub-forums to Deepen the Change. The indigenous gathering has reaffirmed defense of territorial rights, including a highway-free TIPNIS as the top of its agenda.